Barbara Ladin Fisher is a master craftsman of ultrasuede fabric appliqué. 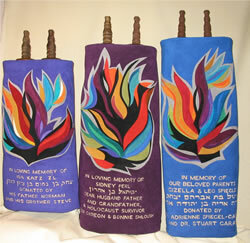 Barbara’s mission is to create beautiful Judaica for synagogues and homes. Her works are owned by synagogues and individuals across the United States, Canada and Israel. This website is a good place to get a sense for Barbara’s style and use of color. Feel free to call her directly with any questions.